Is this a typical Korean expression? Yes, this is a typical pick-up line in Korean. How can this be used as a pick-up line? Calling this creepy is zombism. Don't judge them like that. They were born people too. Was someone watching 부산행 (Train to Busan) when they wrote this? The zombies are coming for your brains! Zombie food? This is an odd example, and not really helpful. Is Duolingo a zombie now? Why is 뇌... 뇌가 필요해 -> Brains... need brains wrong? Why is the answer Brains... I need brains. I don't see the "I" in Korean. In English, subject pronouns or pronouns in general are needed in every sentence. However, in Korean, they can be omitted while still conveying intended meaning based on context. Therefore, you cannot directly translate each sentence one-to-one, and hence "Brains ... need brains" is wrong. Both should be accepted. But not because of the Korean. 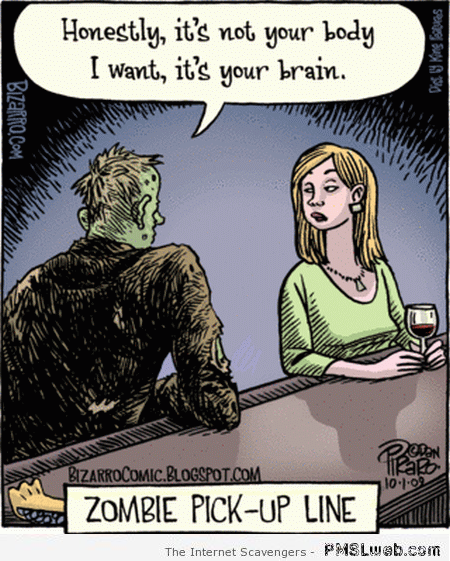 Zombies tend to use very simple statements missing extraneous words.